If one single reason explains how humans have come to dominate so much of Faerûn compared to older, wiser races, it might be this: Humans are Toril's best merchants. The great ports of the Inner Sea spin gold like a spider spins silk. Dwarves excel at pure industry and craftsmanship, and elves command ancient magic conceived long before humans walked Faerûn, but humans command a different and perhaps more powerful magic - the magic of gold. The growth of human prosperity and influence in lands that were once wilderness is the single greatest development in the Heartlands of Faerûn over the last thousand years or so. Human settlers carve out freeholds and villages from the virgin wilderness, often fighting for their lives and property against the monsters (or sometimes the elves, fey folk, or forest creatures) who dwell there. From the new settlements flow raw materials such as timber, furs, valuable ores, and perhaps fish or meat. More humans come to harvest the waiting riches, and new cities are born. Eventually a city is surrounded by farmland instead of forest, and the process repeats in some other trackless forest or mountain valley. Hard work is a way of life throughout the Heartlands. As in the medieval society modeled in the DUNGEON MASTER'S Guide, the standard wage for a day laborer is a single silver piece. In agricultural regions, most people work from sunrise to sundown, with breaks for, meals and naps. Common folk working for the daily silver piece might resent adventurers, whose economy functions at an entirely different level as detailed its the price lists. But common folk seldom risk death and dismemberment on a daily or hourly basis. Given the number of adventurers who wind up dead long before their day-laboring relatives, the adventuring lifestyle is viewed as an occupation for those who like to gamble with their lives for potentially great rewards. Common folk, artisans, merchants, and even the nobility routinely work tenday after tenday until a religious holiday, local festival, or one of the annual holidays rolls around to give them a day off. Some parts of the Heartlands have gradually accepted the idea that people who do not want to work every day, and whose duties and responsibilities allow it, can take the tenth day of the week off. There is no standard name for this nonholiday day of rest. In the Dalelands, for reasons no one knows, they call it the "elf day." In Cormyr they call it "dragon-rest," saying, "Even a dragon has to rest." In any given town, hamlet, or city, some folk choose to work through the tenday. But the day of rest has become common enough that nearly everyone associates the tenth day with some form of avoiding one's duty. Raising both open palms, showing all one's fingers, and waving them back and forth has become visual slang for "just taking it easy, not doing anything much." Few of the human kingdoms and cities of the Heartlands permit slavery within their borders. Indentured servitude and serfdom are relatively common practices that approach the hopelessness and brutality of slavery in some lands, but even the most wretched serf or servant is considered a human, being, not property. This does not prevent slavers from other regions or races from seeking their quarry in these lands. Orcs and goblins sweep down from their mountain strongholds, carrying off unfortunates to brutal thralldom in their mines and fields. Pirates of the Inner Sea frequently sell their victims into captivity in the eastern lands of Mulhorand or Thay. Parties of Zhentarim slavers brazenly ply their trade almost anywhere in the Heartlands, deterred only by the most vigorous and aggressive defenses. Thayan enclaves in many of the more dangerous or lawless cities openly trade magic devices for slaves, and are rumored to deal in slaves secretly in cities where they are not allowed to do so openly. Outside the Heartlands, slave-owning societies are much more common. Zhentil Keep and Mulmaster in the Moonsea make extensive use of slave labor. The societies of the eastern lands - Thay, Mulhorand. and Unther - are founded on the ceaseless toil of millions of state-owned and privately held slaves. In these lands, a free peasant or small common-born farmer simply does not exist. All lands are worked and all menial tasks performed by slaves. A strong, healthy slave costs between 50 and 100 gold pieces in lands where slavery is common. Conditions of slavery vary wildly between different lands. Slaves in Mulhorand outnumber the free citizens - and, not surprisingly, the life of a slave in Mulhorand is little worse than the life of a peasant in most other lands. Slaves in Thay and Unther endure far harsher treatment, both by callous masters and a society that considers them to be nonentities. Anyone unfortunate enough to fall under the cruel dominion of ores or goblins rarely lives out a year of abject misery before succumbing to overwork, malnutrition, and various slave-baiting "games." Regardless of the conditions, most Heartlands humans find slavery extremely distasteful at the very least, and more than a few consider it an abomination in the sight of the gods. With the exceptions of the gnomes and perhaps the Lantanese, the people of Faerûn possess few machines more complicated than a waterwheel mill and no engines capable of replacing a team of strong horses or a good stiff breeze. Every endeavor from plowing to harvesting, from woodcarving to the refining of valuable ores, is accomplished by human hands, human backs, and human minds - or dwarven, elven, goblin, halfling, or orc labor, depending on the realm in question. Farms worked by more than an extended family and perhaps a hired, hand or two are extremely rare, although the slave fields of Mulhorand and Thay break that rule. Workshops or smelters requiring more than a half-dozen trained workers are also very rare. Every carved chair or table is the unique creation of a skilled craftsman, every apple is handpicked, every wheel of cheese or smoked haunch of meat handmade. The principal crops in the Heartlands of Faerûn are grains (wheat, barley, rye, and others), corn, and a great variety of vegetables. Orchards and vineyards are also common in climes favorable to fruit trees and grapes. Planting usually takes place in early or mid-spring, some time in the month of Ches or in Tarsakh. The principal harvesting generally occurs in Eleint. Most civilized areas in the Heartlands farm with iron plows, often single-bladed. All other work is done by hand and with hand tools. Most rural areas grow all their own food, but many of Faerûn's larger cities import vast quantities of grain, produce, fruit, or other types of food that their land and economy are unsuited for. Minor magic can help keep food fresh for as much as two or three days longer than normal, but few traders carrying perishables dare travel farther than that. Lands too steep, arid, or dangerous to farm are often suitable for animal husbandry. Herds of sheep or goats can flourish on rocky hillsides, boggy tundra, high mountain pastures that are snow-free for only a couple of months of the year, or in regions subject to monster raids or banditry - provided the shepherds are wary enough to remove their livestock from harm's way. Grazing herds of domestic animals is not a particularly efficient way to feed large numbers of people. It takes ten times as much land to produce a pound of meat as it does a pound of grain. But herd animals also provide milk, cheese, bone, leather, and even manure for fertilizing crops. In the Heartlands, the most common domestic animals are cattle, chickens, goats, pigs, and sheep. Any farmer keeps a small number of these animals on whatever land he can spare. In the southern plains of the Shaar, Dambrath, and Estagund, great herds of cattle are the primary source of livelihood for most people. In the cold and rocky hills of the north, goatherds and shepherds raise small flocks in every mountain pass and dale. Of course, Faerûn's numerous large, dangerous predators and monsters account for high losses. Most shepherds go about their work armed with slings and spears at the very least. More commonly, a goatherd arms himself with a pair of ferocious and well-trained wolfhounds and a sturdy crossbow. Steel weapons and armor don't grow on trees, nor do tin cups, copper kettles, iron pots, or gold and silver jewelry. Valuable ores are mined wherever they are found in all lands of Faerûn, excepting only the most primitive and remote regions. Iron, copper, lead, tin, and zinc are the most commonly mined and smelted ores. Coal, guano, and peat are quarried or cut as well. Dwarves and elves have held the secret of steelmaking for thousands of years. Most human kingdoms of the Heartlands work in steel as well. Beyond the Heartlands, steelwork is much less common. In Unther and Mulhorand, these extremely conservative cultures eschewed technological innovation for centuries after the western humans learned the secret of iron. Before the decline of their empires, the bronze-armored soldiers of Unther and Mulhorand conquered almost half the known world despite their technological backwardness, bolstered by highly organized states, the direct leadership of their deities, and the zealous use of magic. Bronze armor is symbolic of former glory in both lands, although Mulborand's legions wear iron now, and even the most obstinate of Unther's warlords have abandoned the old ways. In the lands of the Unapproachable East, steelwork is rare as well. The arms of Narfell and Rashemen are made of cold-wrought iron. The more advanced tribesfolk of the Chultan jungles make spearheads and arrow points of copper, trading for iron blades whenever possible. The masters of both mining and metalwork are, of course, the dwarves. The shield dwarves work principally in the base metals - lead and iron. Their steel weapons and armor are the best of Faerûn. Gold dwarves excel at more decorative work, although their arms and armor are nearly the match of their northern cousins' work. Most of Faerûn relies on well-trained scribes to copy volumes by hand. This tedious work drastically limits the number of copies of a manuscript. It's an unusual book indeed that exists in more than a dozen copies, each hidden away in a noble's library or in a temple sanctum. The Lantanese build simple, hand-operated printing presses under the auspices of Good, but to date have kept them secret from the trading powers of the Sword Coast. The most common writing surface is parchment made from the skins of sheep, goats, or calves. Parchment sheets can be laboriously scraped clean and reused. More than one priceless ancient text has been destroyed by a careless scribe desperate for parchment to write on. True paper made from wood pulp is rare, occasionally created as a result of alchemical processes rather than technological methods. Books of spells and other important books are often written on vellum, parchment made from the skin of newborn calves. Vellum is not as sturdy as parchment but provides a higher-quality writing surface. All books are bound by hand, and the pages are, sometimes stitched to leather sheets and protected by covers of leather-covered wood. In eastern lands, books are more likely to be assembled by stitching pages side to side to create a long, continuous scroll that is then wound onto two wooden handles and protected by a snug-fitting leather scroll tube. Although many folk are tied to the land and seldom travel far from home, a surprising number of others crisscross the continent for years at a time for business and trade. The paramount travelers are merchants, peddlers, mercenaries, and drovers, all of them moving goods or services (their own) from one place to another. Travel by barge on an inland waterway is easiest and cheapest - either drifting downstream steered by oar and pole, or working upstream, sometimes aided by beasts towing from shore. Sea travel is faster and less costly in terms of manpower when hauling bulk goods - hence the string of seaport cities up and down the coasts of Faerûn. Air travel by steed or device (such as flying carpets or Halruaan sky-ships) features often in tavern tales, but in personal experience is almost unknown to the common Faerûnian. 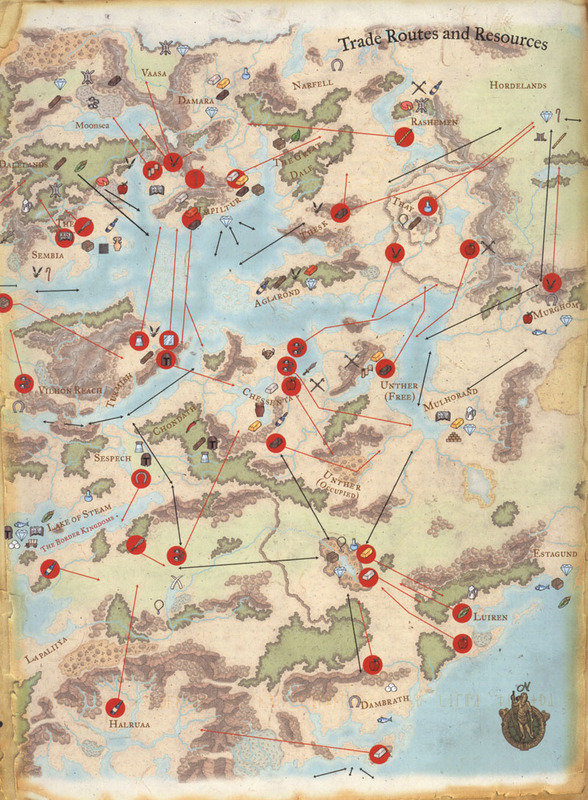 Dragons, storms, and other perils of the air restrict such travel to military uses, or to individuals who are either personally powerful (mages) or need to move far and fast, such as messengers conveying vital information or items of great worth. Wizards' teleport spells and portals that convey anyone from one spot across great distances to another also provide unusual modes of transport. 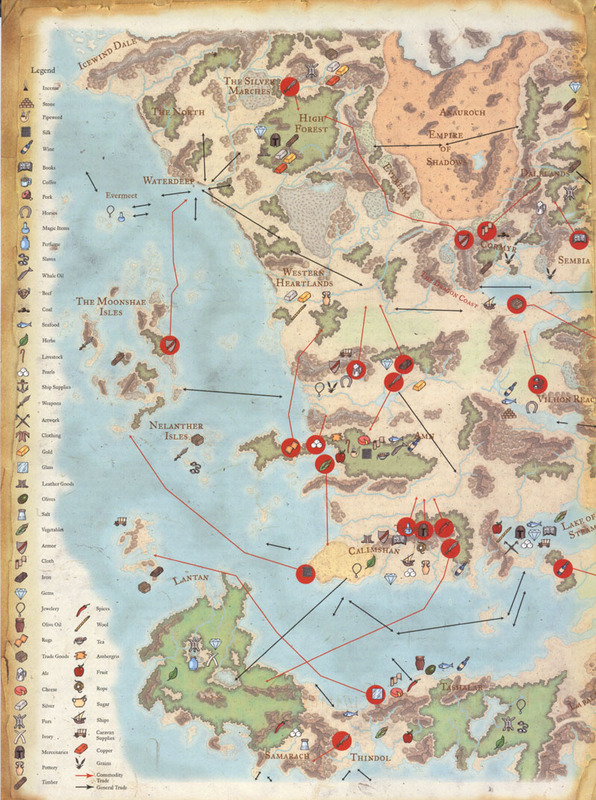 Most travel on the surface of Faerûn is by foot. The walking traveler often leads a pack mule or train of pack mules, tows a travois, or drags or pushes a small cart. She might ride in a wagon or cart, go alone by horseback, or travel afoot with whip or staff, guiding an oxcart. In some southern lands she might travel by palanquin, carried by sturdy bearers. Most of the roads of Faerûn are dusty tracks between cities and outposts, wide enough for one wagon and a horse passing in the opposite direction. Major trade routes such as the Trade Way running from Waterdeep to Baldur's Gate can fit three or even four wagons across at the same time. Paved roads are nearly unknown, but the largest trade routes consist of hard-packed dirt and grass over sunken cobblestones so that caravans escape the dust and mud plaguing smaller tracks. Cities tend to have the best travel surfaces, streets of cobbles or gravel or hard-packed earth that turns to mud in wet weather. These tend to be choked with traffic and obstacles such as vendors' stalls, wagons, and stacked goods at all hours, restricting the fastest movement to the walking traveler. The lone walker can usually hide more readily than other travelers, but she is more vulnerable to the dangers of the road. Southern Cormyr, coastal Calimshan near its large cities, and some areas of Sembia and the Dales are exceptions - but even then, cutpurses, crooked innkeepers, and other travelers threaten the lone traveler. In a world abundantly supplied with brigands and predatory monsters, protecting caravans of wagons with mounted guards is almost a requirement. Caravans tend to be of two sorts: the closed or coster caravan (a highly disciplined group of employees working together, often in uniform) and the open or road caravan of mixed-owner wagons and other travelers, who pay a fee to a caravan master to travel under his or her protection. These can vary widely in size, fighting strength, and resources. Any road caravan with a competent master will have at least two spare gear wagons loaded with arms and armor, spare harnesses, replacement wagon wheels and axles, tow ropes and chains, firewood and kindling, tents and repair tools and materials, and four or more food wagons. These spare wagons can be pressed into service as replacements for wagons that must be abandoned or are lost to fire, attacks, crashes, or irreparable damage along the way. Injured beasts of burden are typically sold or butchered and eaten on the road. Almost every inn has mounts and beasts of burden that can be purchased by passing travelers (even if a tired or injured beast is "traded in," innkeepers tend to want a coin or two as well). Many sell gear abandoned or left as payment by previous travelers as well. Caravan centers such as Assam, Iriachor, Ormpetarr, Riatavin, Scornubel, Silverymoon, Teziir, Uthmere, and Waterdeep can replace anything a traveler desires. So can almost all major seaports. Successful caravan masters tend to be veteran guards who've survived the life for decade or more (though a few are veteran merchants), and both they and the mercenaries they hire have trade agents, usually called factors, in every settlement of trading worth in the areas in which they operate. Factors serve as spies, sources of information (about water sources, camping places, and perils), and local arrangers of storage, meetings with smiths, wheelwrights, alchemists and other useful crafters, and hiding places. The lifeblood of Faerûn, trade ties together lands and peoples who might otherwise meet only as enemies - or not at all, depending on the distance between them. The shield dwarves trade their matchless arms and armor for vast quantities of grain, beef, ale, and other foodstuffs hard to come by in their forbidding mountains. The Red Wizards of Thay trade their priceless magic devices for slaves, steel, silk, and rivers of gold. Elven woodcarvings fetch handsome prices in the most expensive scores of Waterdeep, while bolts of good Dalelands linen are carried as far south as the Lake of Steam. Even the fierce goblin tribes of the Cloven Mountains trade coal, iron, and quarried stone to the human lands of the Vilhon Reach. Trade roads, trails, and sea routes bring the goods and materials of distant lands to civilized folk. Most regions produce their own staple items such as basic foodstuffs and clothing, but even the most mundane commodity can be produced cheaper and faster in some lands than others. See the accompanying maps, which detail the largest trade routes.West, East. Great merchant companies dominate the trade of the Heartlands and the Inner Sea. A merchant company buys raw materials or manufactured goods at their point of origin, transports them to the markets in which the goods will fetch the best price, and sells them through company-owned emporiums or through local merchants. Typically, a merchant company's greatest asset lies in the trade routes and markets it controls. A powerful company won't hesitate to use ruthless tactics or outright violence to prevent a rival from attempting to supply a prized market with a competing product. Wherever possible, merchant companies exert their muscle to force the lowest possible prices on their suppliers and monopolize particular goods in their chosen markets in order to command the best price possible. Laws and regulations that might control such practices are virtually unheard of in Faerûn. With a tangled web of city-states, freeholds, and kingdoms competing with each other, merchant companies can run their businesses in any manner they choose. If a particular city or land attempts to force a powerful company to compete fairly, there's always some other market waiting for the same goods and willing to pay the company's price. The term "coster" properly applies to an alliance of small independent traders or merchants who band into shared caravans for safety in travel. The coster itself is a business that survives by selling caravan space to other merchants, who naturally have a say in how their goods are transported to market. Costers frequently hire adventurers and mercenaries to make up shortfalls in caravan guards. It's not especially glamorous, but a character can usually negotiate a fee of 1 to 20 gold pieces per level per day to guard a caravan through dangerous territory. The fee varies widely with the skill and reputation of the character, the condition of the road, and the coster's financial situation. Most Faerûnian cities with dangerous country nearby have many costers - and they employ more adventurers, and more often, than any other group in Faerûnian society. Coster hires soon learn the unwritten code of the industry: "Break nothing, and admit less!" Barter and sworn "I owe you" declarations may suffice for trade on the frontier, but portable wealth in the form of hard currency is mandatory for any kind of stable exchange over long distances and strange lands. While barter, blood notes, and similar "letters of trade" are common enough in Faerûn, metal coins and trade bars are the everyday currency of trade. Like the baseline economy in the DMG, Faerûn's economy works on the silver and gold standard. Other metals, including copper and platinum, are used in specific nations and cities, but silver and gold coins are accepted throughout most of the trading communities of the Heartlands no matter which kingdom, city state, or elder race stamped them. Paper currency is almost unknown, though Cormyr, Sembia, and Archendale recognize IOU notes signed in the blood of the parties to the contract and affixed with the seal of a royal agent appointed to watch over trade. Coins come in a bewildering variety of shapes, sizes, and materials. They're minted here, there, and everywhere - though most countries simply use whatever coinage passes by. Except in special situations where a local coin or token may have an unvarying, artificially supported worth, coins are valued for the metal they're made of, not age, rarity, or whose face they bear. For this reason, platinum pieces, minted only in a few lands and regarded with suspicion in many places, have fallen out of favor. Nonetheless, they remain in circulation. A coin's value is expressed firmly in terms of how it relates to a gold piece - a "standard" gold coin, circular and unpierced, about an eighth-inch thick and an inch and-a-quarter across. "Shaved" coins, deliberately cut or worn thinner, are worth less. The current standard is: 10 coppers = 1 silver; 10 silvers or 100 coppers 1 gold; and 10 gold = 1 platinum. Thanks to the ambitious traders of Sembia, its oddly shaped coins can be found everywhere throughout Faerûn. Many other human nations and city-states mint their own coins. Few achieve widespread distribution, but nearly all are accepted by everyone except those looking to pick a fight with a stranger. In Waterdeep, the bustling cosmopolitan center of trade, coppers are called nibs, silvers are shards, gold pieces are dragons, and platinum coins are suns. The city's two local coins are the toal and the harbor moon. The toal is a square brass trading-coin pierced with a central hole to permit it to be easily strung on a ring or rope, worth 2 gp in the city and nothing outside Waterdeep. The harbor moon is a flat crescent of platinum with a central hole and an electrum inlay, worth 50 gp in Waterdeep and 30 gp elsewhere. Iron steelpence replace copper coins in rich and bustling Sembia. Silvers are ravens, gold pieces are nobles, and platinum coins are unknown. All coinage is accepted in Sembia (including copper pieces from elsewhere). Sembian-minted coins are square if they're iron, triangular if silver, and five-sided if gold. In Cormyr, coppers are called thumbs, silvers are silver falcons, gold pieces are golden lions, and platinum coins are tricrowns. In Southern lands, coppers are bits, silvers are dirham, and golds are dinars. Folk of some lands (notably Thay and Halruaa) use the currencies of other realms when trading abroad because their own coins and tokens are feared to be magically cursed or trapped, and so are shunned by others. Conversely, the coins of long-lost legendary lands and centers of great magic are honored, though persons who find them are wise to sell them to collectors rather than merely spending them in markets. Particularly famous are the coins of Cormanthyr: thalvers (coppers), bedoars (silvers), shilmaers (golds), and ruendils (platinum). These coins are fine, numerous, and sometimes still used in trade between elves. Large numbers of coins can be difficult to transport and account for. Many merchants prefer to use trade bars, ingots of precious metals and alloys likely to accepted by virtually anyone. Trade bars are stamped or graven with the symbol of the trading coster or government that originally crafted them. A 1-pound trade bar of silver has a value of 5 gp, a 1-pound gold bar is valued at 50 gp, and heavier bars are worth proportionally more. Trade bars typically come in 1-, 2-, 5-, and 10-pound weights. The city of Baldur's Gate mints large numbers of silver trade bars and sets the standard for this form of currency. Damaged bars are virtually worthless, but bars issued by defunct costers and fallen countries and rulers are usually worth face value. The city of Mirabar issues black iron spindle-shaped (with squared ends) trade bars weighing about 2 pounds each, worth 10 gp in that city but only 5 gp elsewhere. Gold trade bars are very rare. Only the wealthiest and most powerful merchants and nobles smelt these bars, since only the largest transactions require a currency with such a high face value. Coins and bars are not the only form of hard currency. Gond bells are small brass bells worth 10 gp in trade, or 20 gp to a temple of Gond. Shaar rings, pierced and polished slices of ivory threaded onto strings by the nomads of the Shaar, are worth 3 gp per slice. Some undersea races typically use pearls as currency, particularly those who dwell in the shallows and trade with surface races. The value of a pearl varies by size - a quarter-inch diameter is the standard - rarity, and quality (freedom from flaws). In the Sea of Fallen Stars, a white pearl or seyar is worth 1 ep "below the wave" and averages 2 sp in value ashore. A yellow hayar pearl is 1 sp undersea and averages 2 gp ashore, a green tayar is 1 gp and 20 gp respectively, and a blue nuyar is 5 gp "wet" and 100 gp "dry." The most prized pearls of all are olmars, the 7-inch-long, 3-inch-wide diamond-shaped olive pearls of great clams, worth 500 gp among the aquatic races and over 2,000 gp ashore.